Looking for a Miniature Pinscher? 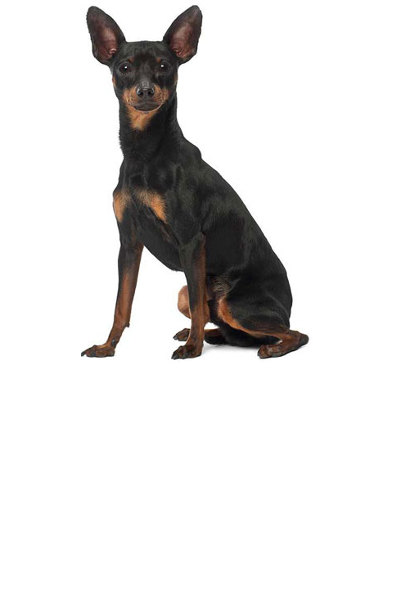 The Miniature Pinscher may look like the miniature of the Dobermann Pinscher but the two breeds are actually unrelated. 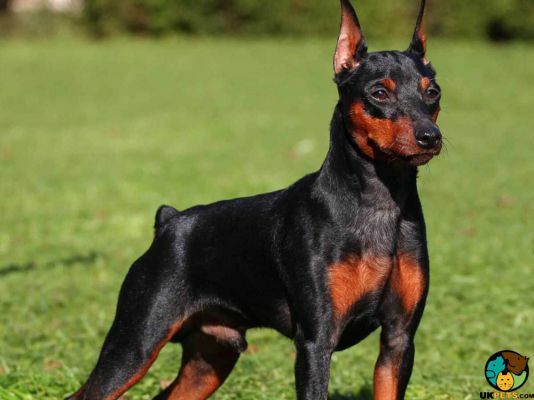 Rather, it is a smaller variation of the German Smooth Hair Pinscher, weighing 8 to 10 pounds and standing 20 to 35 centimetres at the withers. It is an intelligent and loyal dog that has a tendency to be stubborn. Are you thinking of welcoming a Miniature Pinscher to your home? Read this brief background of this tenacious toy dog to see if it suits your personality. The Miniature Pinscher is believed to be an ancient breed but there is no breed documentation to support this claim. 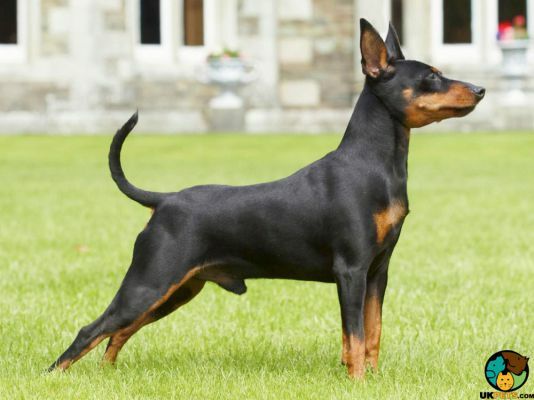 A common misconception about the Miniature Pinscher is that it is the mini version of the Dobermann Pinscher. While the two breeds may have come from Germany and are similar in appearance, they are not actually related. The former is a different breed in its own right and originated long before the latter. 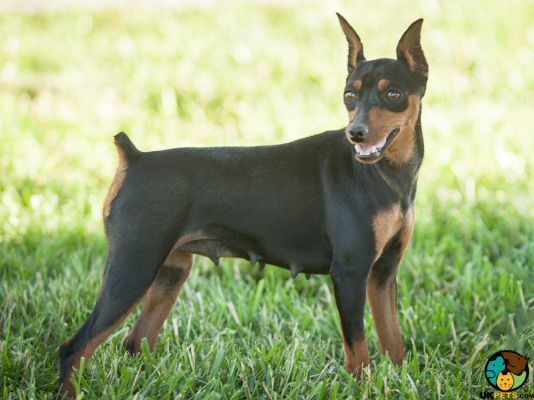 Instead, the Mini Pin is a smaller variation of the German Smooth Hair Pinscher, an older breed existing since the 16th century. There were also claims that the Mini Pin was a cross between the Italian Greyhound and the Dachshund. It was first named the Reh Pinscher because it looked like a roe deer found in Germany. Its main role was catching rats and other vermin in homes and stables. The Miniature Pinscher rose to popularity until the 20th century. However, because of the First and Second World Wars, the numbers of this breed suffered. The dog was saved from extinction through the efforts of enthusiasts but its numbers remain low in other parts of the world, including the UK. It is registered with The Kennel Club under the Toy Group. 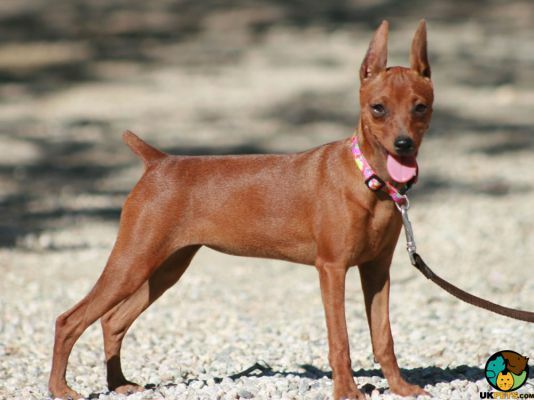 Albeit unrelated, the Miniature Pinscher looks like a tiny Dobermann. It is a well-balanced and nicely proportioned dog with an average size is 8 to 10 pounds and 20 to 35 centimetres. It has an elongated and narrow head, strong muzzle, black (sometimes lighter to match the coat) nose, black eyes, and small ears that are set high. It also has a strong jaw with a perfect scissor bite and powerful and slightly arched neck that provides a graceful appearance. The Mini Pin boasts of a smooth, shiny and close-lying coat that comes in black, chocolate, and blue with tan markings. Solid red is also acceptable. 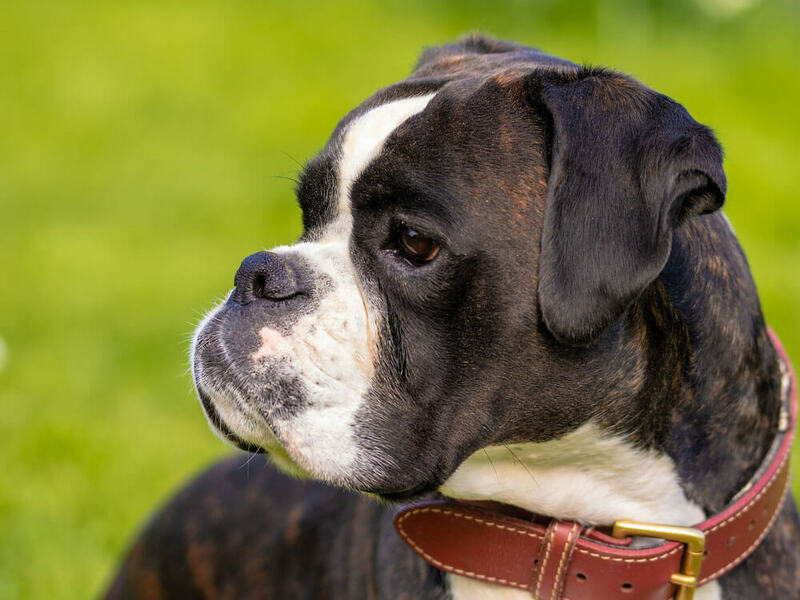 This short coat is pretty easy to maintain because it only requires brushing once or twice a week to keep all-year-round shedding under control. Brushing would become more frequent during the spring and autumn when it sheds more heavily. A chamois cloth will also keep the coat clean and shiny, so bathing can be done only a few times a year. Owners also need to pay attention to the Mini Pinscher’s oral care, making sure its teeth are brushed at least twice a week and it is given chew toys to remove tartar build-up. Its ears should also be checked and cleaned at least every two weeks as they can harbour bacteria that can cause infections. Lastly, its nails should be trimmed regularly especially when you hear clicking sounds on the floor. Most dogs usually dislike this process so it is important to introduce this routine activity while it is still a puppy so it gets used to it. The Miniature Pinscher is a loyal, alert and fearless dog often described as the King of Toys. It forms an unbreakable bond with its owners and would suffer from separation anxiety when left alone. It is full of energy, clever, curious and vigorous, and can be a handful at times, which is why it is not recommended for new dog owners. It needs an experienced dog owner that will take the alpha role from the get-go. It has a tendency to be stubborn and strong-willed and would selectively listen. Even though it is small, it is quick to alert when it senses the presence of strangers. It is wary of people it does not know but would prefer to stay away than be aggressive. Although small, it has loads of energy so it is better off to families that lead active, outdoor lives. Mini Pins are usually calm around kids but they would do better with families with older children that know how to tiny handle dogs. Because of its size, it can easily be dropped by toddlers. Regardless, parents should supervise child-dog interactions and teach kids to treat animals with love and respect. Mini Pins also tend to be snappy when playtime is too boisterous. When it comes to other dogs and pets, these tenacious dogs get on well with animals they grow up with, even cats. However, they can be a bit aggressive around dogs of the same gender, not realising how small they are. They can also consider smaller animals as fair game so owners also need to keep a close eye. 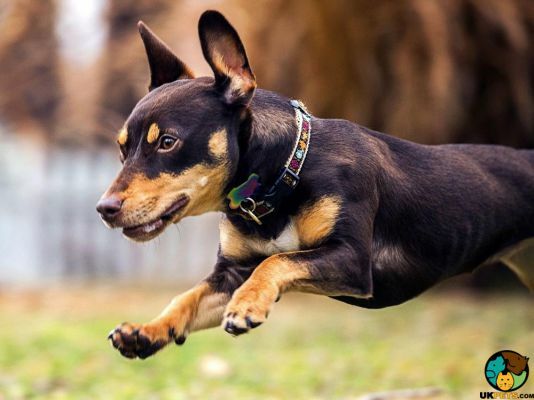 Despite being intelligent and a quick learner, the Mini Pinscher can prove to be a challenge during trainings because of its strong-mindedness. It is also quick to pick up some bad behaviours. However, early training and socialisation under the right trainer would make it more cooperative and obedient. Trainings should focus on basic dog behaviour, which would curb its digging, barking and chewing tendencies especially when left alone. A typical serving for an adult Miniature Pinscher is 1/2 to 1 cup of excellent quality dry dog food per day. Food needs to be carefully given according to its age, size, build, activity level, and metabolism. Since tiny dogs are prone to obesity, always measure your Mini Pin’s food and avoid free-feeding. Feeding your Mini Pin does not have to be hard. Whether you choose homemade or commercial dog food, make sure you provide it with high-quality food with meat as its number one ingredient. Homemade food allows you to know the exact ingredients you are feeding your dog but make sure to include supplements to avoid nutritional deficiencies. Commercial dog food is a practical option but make sure to select a top-quality brand with limited ingredients. Kibbles promote chewing, which can prevent tooth problems. The Miniature Pinscher is a generally healthy dog that can live up to 14 years. However, there are certain hereditary and congenital health conditions it is prone to develop. These include Alopecia, Congenital Deafness, Diabetes, Glaucoma, Legg-Calve-Perthes, Mucopolysaccharidosis, Optic Nerve Hypoplasia, Patellar Luxation, and Progressive Retinal Atrophy. Being an energetic and intelligent dog, the Mini Pin needs the right amount of physical and mental stimulations. This tiny breed needs about 20 to 30 minutes of daily exercise in the form of walks, games and free time at a fenced garden. When not able to release its energy, it tends to be destructive. Always be vigilant because it tends to chew anything it sees. This is certainly risky as it may suffer from choking or intestinal blockage, which can be fatal. Also make sure your fencing is strong and without gaps as it can easily slip out unnoticed. Regardless of the breed and size of the dog you choose, you are bound to spend a lot of money to ensure it lives a happy life. Buying a well-bred Miniature Pinscher puppy is not easy as only a few puppies are bred in the UK. You will have to be put on a waiting list and expect to shell out around £300 to £800. A tiny dog with low grooming needs like the Miniature Pinscher is relatively more affordable to raise than other breeds. The estimated monthly cost of caring for one is around £50 to £80, which includes food (£20 to £30 a month), veterinary expenses (up to £800 a year) and pet insurance (starting at £20 per month for basic coverage). Not included in the estimate are initial basic equipment (around £200) and vet bills not covered by insurance when your pet gets sick. 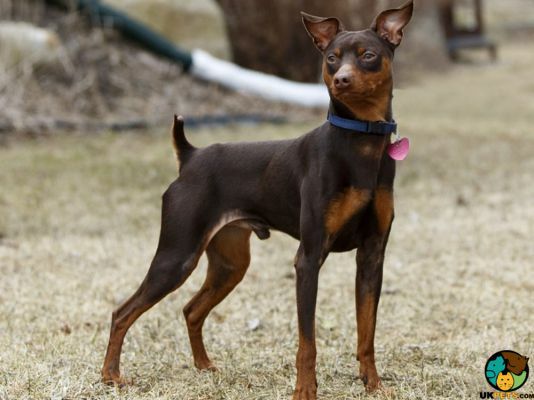 Is a Miniature Pinscher Right for You? 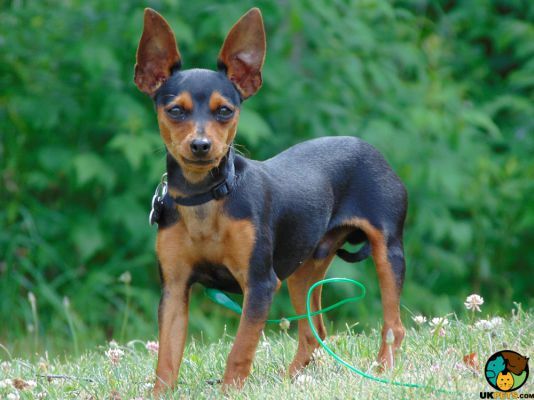 The Miniature Pinscher is an intelligent, alert and loyal toy dog. It is more suitable to families with older children and experienced dog owners. It is a tiny dog that is more affordable to raise and care for compared to other breeds. This pooch has a tendency to bark, dig and chew when bored. It has low grooming needs and would only require weekly brushing.